Now, I'm not going to pretend I like Piers Morgan. He's done a lot of stuff I don't agree with so I think he's a bit of a dickhead. However, this clip of him (hypothetically) threatening a 12-year-old's cat is hilarious. A bit of context would probably be useful here. Basically, the girl's name is Aryanna Gourdin and she's become a prominent figure in the pro-hunting community. This is all thanks to her social media 'selfies' where she poses with dead animals. The one that caused the most controversy was when she posed with a dead giraffe that she'd just shot herself. 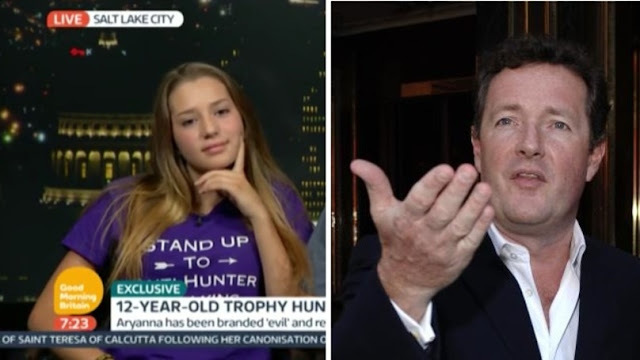 Speaking from Utah via video sat alongside her dad, she explained on Good Morning Britain, which is on ITV every weekday morning 6-8.30am: "I like hunting because it's something that's been in my family a long time. "And I really enjoy the taste of the meat we kill." She's received death threats because of her controversial hunting selfies. Explaining, she said: "I'm very upset that people would value an animal's life over another person's. "I try to ignore most of the comments I get but I do read some by accident. I just try to not let them get to me. "It won't stop me hunting. I will always hunt. It's something that thousands of people do and it's never going to stop." When Piers went in by asking if they'd be upset if he killed Aryanna's cat, the family were furious. Piers explained that there was a level of irony in the fact that, on her Facebook profile, she's proudly stood next to animals she's shot, but also there's pictures where she's cuddling her cat. Her dad, Eli, retorted: "That's a trick question. We have never killed a pet. That's a derogatory question and it falls into the same category as the death threats. We would never think to kill somebody's pet!"